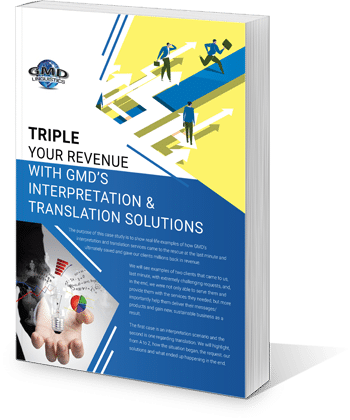 Read the GMD Case Study Triple Your Revenue with GMD’s Interpretation & Translation Solutions and learn what two of our customers had in common: not only were we able to assist our clients by satisfying their needs, but more importantly we were able to create durable relationships and assist them in making lots of money in return. It is our goal and top priority to help our clients succeed, save money and ultimately make more money/revenue. By assisting them with their language related needs, we enable them to open doors into new countries and markets, which would have otherwise been unattainable. We all share this world together. So why not create and promote circumstances where we can all mutually benefit and work hand-in-hand? Simply fill in the form and click GET IT NOW to download your free Case Study.